I fell in love with canvas prints a few years ago. I was visiting my friend Kerry to meet her then-infant daughter, Aili. The living room had three gorgeous canvas prints depicting stages of their family. If my memory serves me correctly, there was a wedding photo, a stunning pregnancy photo of Kerry standing by a window, and... I think the third was a baby photo of Aili. (Help me out, Kerry.) 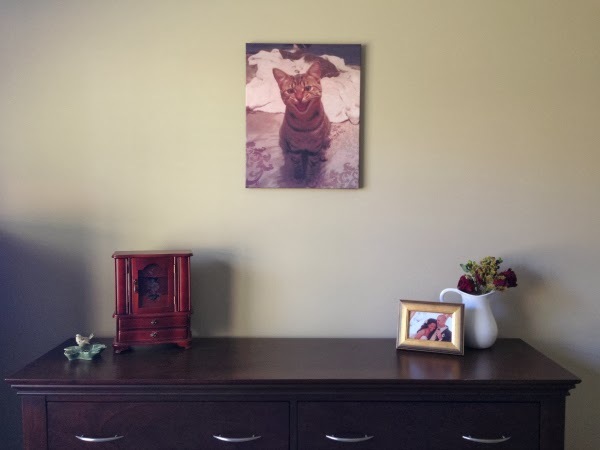 I had gotten married just a couple weeks prior, and I made a mental note to get canvas prints. But holy smokes! I soon found out that they cost a pretty penny. Flash forward two and a half years, and Easy Canvas Prints enters the picture. Their name says it all. For starters, the website is incredibly easy to navigate. You can dive right into designing your canvas or browse through the Ideas gallery. More than that, the prices are so affordable. The ordering process walks you through all the options (size, display options, border, color, and retouching), and voila! Your order is on its way to being processed, and you'll have a beautiful canvas on your doorstep in under two weeks. While this may have been the perfect opportunity to print a professionally shot wedding photo, Mr. TBS and I decided to welcome a life-sized Baby Boone (six months old!) to our wall. Can you blame us? Don't even get me started on sleeping Amelie in the background. Ha! This photo is the perfect snapshot of who they are as a pair, and it is so special to us -- even though the Droid phone camera quality pales in comparison to a fancy DSLR. But even then, Easy Canvas Prints produced a great canvas print! I plan to display it on unpainted pallet wood, eventually. Sign up for the exclusive deals on the homepage to get anywhere between 40-65% off! 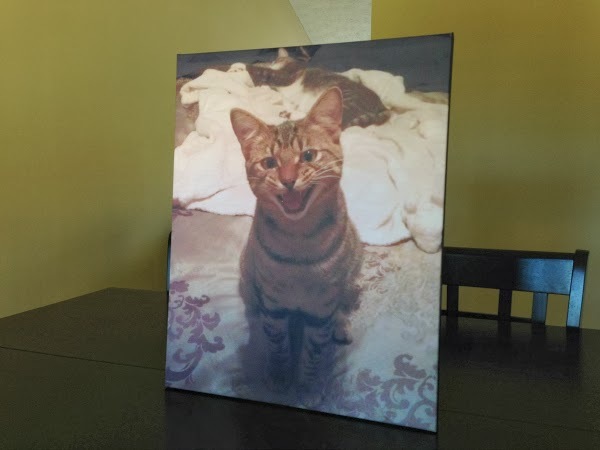 ** I received a complimentary canvas print in exchange for my thoughts on the product. All opinions are my own. Ooh, I love these! Maybe I'll ask for one for my birthday. It's a little late for asking for Christmas presents.